With the Big Event taking up all our TV time, it can be tough not to crave adding some gold to your own life. While gold medals and jewelry are crazy expensive, adding some spray paint or faux gold to your DIY crafts is cheap, easy, and chic! Look out below for some gold craft ideas that you are going to love. Whether you are looking to add faux gold jewelry to your life or a touch of gold to your home décor ideas, this list is full of shining star ideas. Get to crafting immediately with these Big Event-inspired ideas immediately! 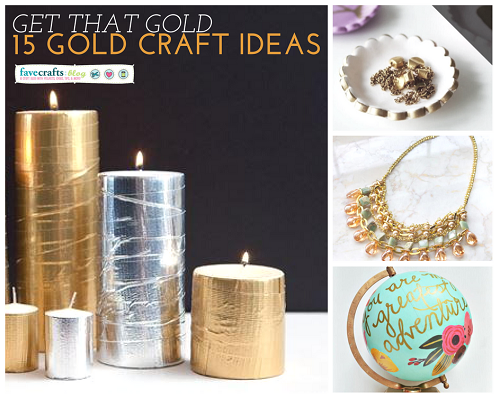 Add glitter and gold to your world with the DIY crafts in get That Gold: 15 Gold Craft Ideas! What’s your fave metallic to work with: silver, gold, bronze, or something else (like rose gold)?